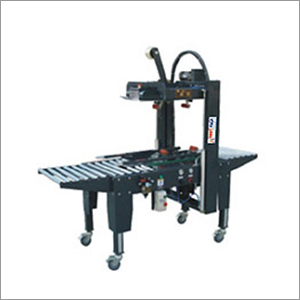 As the leading Manufacturer, Service provider, Exporter of Random Carton Sealer Machine, our company Shri Vinayak Packaging Machines Pvt. Ltd. has earned the status of the quality concerned company. The product is extremely durable, has low energy consumption of 220 W, and its packaging speed is 24 m per min. Various tapes that are compatible with this model are BOPP, water free adhesive tape, and PVC adhesive tape. Treating quality as a paramount factor in our business, we have attained utmost satisfaction of valued customers. We follow Stringent Quality Control Measure in our production process to deliver nothing but the best random carton sealer. This machine is ideal for heavier goods. Depending on the size of cartons, the height and width can be adjusted. We have a perfect amalgam of ultra modern machinery and highly competent workforce, being strengthened to manufacture world class sealing equipment. Our advance manufacturing unit is located at New Delhi.